Sandblasting must be carried out with proper safety equipments in place and must be handled with care otherwise it can cause anaphylactic shock to the operator or the person getting in contact. 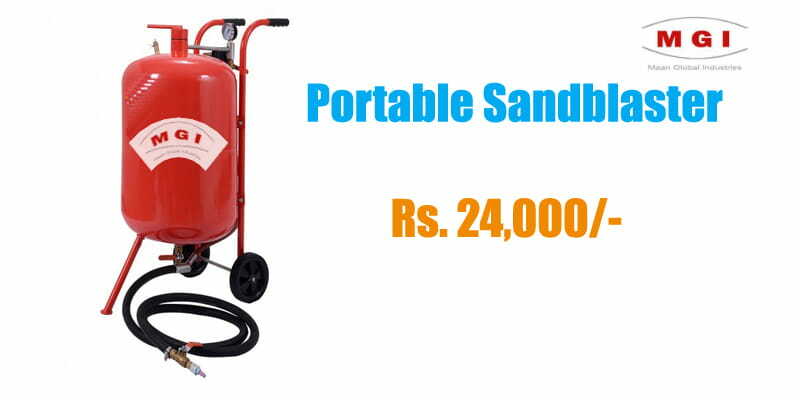 A Portable sandblaster for sale in India is powered by an air compressor that provides a large volume of high pressure air to the blast pot. A blast pot is a like a hollow cylinder that contains the abrasive (media) material and are filled with compressed air to propel the abrasive material at high speed into the blast line. Sandblasting saves both time and money by cleaning the surfaces within minutes compared to several hours or days required to clean or smoothen large metal surfaces or concrete surfaces. Sandblasting process is being adopted everyday by both small and mid-sized businesses that were previously using other traditional surface cleaning methods as it sandblasting is much more economical. A portable Sandblaster for sale in India can be used to clean and smooth large metal surfaces or concrete surfaces or floors and it is extremely affordable as well. A typical sandblaster contains sandblasting gun through which the abrasive material is blasted on a surface, It also has an air compressor connected to it and a blast pot that contains the abrasive material and then filled up with the compressed air. The cost of portable sandblaster for sale in India is Rs. 24,000 and it can be used for sandblasting purpose for cleaning large metal surfaces, steel structures, boiler, containers for sugar mill, rusted pipes, alloy wheels, old ships, concrete surfaces, floors and any other surface that needs to be cleaned, smoothen or roughen. Very useful in bringing shine to the aluminium alloys, car alloys and motorcycle rims. Any surface can be cleaned and prepared quickly before painting within minutes with the help of a portable sandblaster. Call us immediately for the Portable Sandblaster in India or email us.